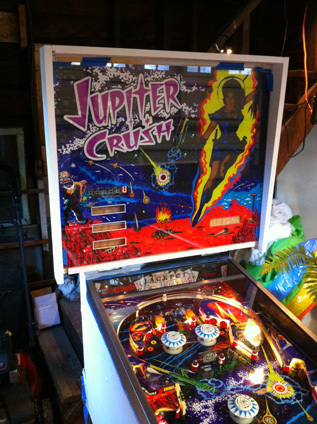 Jupiter Crush is a newly-built custom pinball machine, using a mix of vintage and reproduction playfield machinery (Bally, Williams and Gottlieb) with new microcontroller electronics, and original artwork with a retro sci-fi theme. 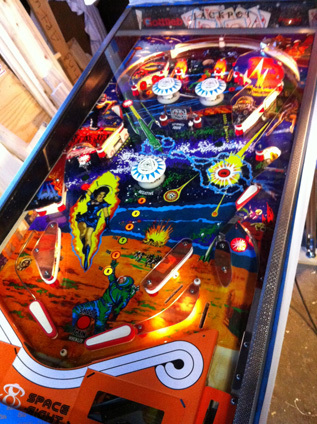 On the surface, this pinball is designed to look and play like a vintage 70's to 80's machine. However, instead of silkscreening, the custom artwork is printed at 600dpi directly onto a mylar film, with a high gloss laminate for protection. Behind the retro scenes, there are modern microcontrollers and power electronics, using high-speed serial communication and a USB interface for running and programming the game rules. Some of the electronic circuits are unique and highly customized, while others are off-the-shelf units from PinScore or MultiMorphic. In all cases, a network of Arduino Duos with custom firmware are used to interface and control individual boards, read the playfield switches, keep score and set the game rules. SOLENOID DRIVER: 38V output using a Power Driver 16 from Multimorphic on an SPI interface to the main Game Controller. The cabinet for Jupiter Crush was donated from a generic Gottlieb game of the late 80's era, which has a steep rise towards the back. The next iteration will probably use something closer to the classic rectangular cabinets of the early 80's. 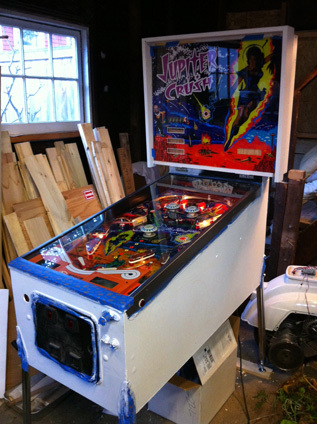 The pinball head and back box, however, was custom fabricated and is an original design inspired by earlier model games. 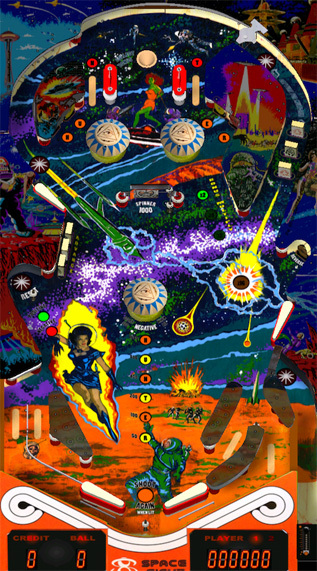 The backglass continues the theme from the playfield, with artwork on a mylar translight behind 1/4" acrylic. This photo shows the cabinet in-process with masking tape and primer, prepared for the final side artwork which will be a standard three-color stencil design in keeping with the sci-fi theme. Completed and installed at the Seattle Pinball Museum on May 19, 2013. 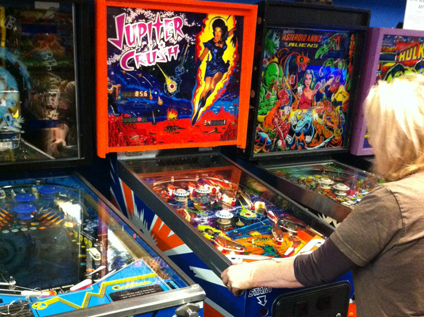 Charlie and Cindy at the SPM have "Jupiter Crush" nestled perfectly in between two machines of the era that JC is trying to emulate: the famous Gottlieb 1981 "Black Hole" on the left, and an "Asteroid Annie" from 1980 on the right, also Gottlieb.